I have returned from the first On The Ground Nicaragua Delegation with lots of good news and some troubling news as well. The good work that the women have done cannot be overstated, but as usual there are some significant challenges ahead of them and they need our support to get over those hurdles. If you are familiar with us you probably know something about FEM and Las Diosas. We first met them in 2006 and began buying their coffee in 2007. They are one of the most dynamic and unique groups that we have partnered with, being an all women’s organization that uses coffee for the empowerment of women and the betterment of their society. FEM (Fundacion Entre Mujeres – “Foundation Between Women”) was founded in 1995 to address violence against women and to promote women’s empowerment in areas of land ownership, health care, reproductive health, violence prevention, and other related issues. They have a big presence in northern Nicaragua and have steadily spread their influence over the years. In 2003, FEM began helping organize female coffee farmers in the north of Nicaragua, and later their affiliated co-ops and collectives helped begin exporting to Germany in 2005. When I met FEM in 2006, we spent time together and mutually decided that Just Coffee Cooperative would be a good fit for a partnership. Both of our organizations saw coffee the same way – as an excellent vehicle to create relationships connecting people in our community to women in theirs. It has been an honor to work with them and they are absolutely one of our closest allies in the coffee world. In 2013, Las Diosas became an organization independent from – but still affiliated with – FEM. Since then, Las Diosas has formed their own Board of Directors, and manage their own finances as well as operations independently. That is a big success story in itself. The women of Las Diosas have dealt with a lot over the past few years. In 2010, one of their communities – El Colorado – was hit with a landslide in a torrential rain storm. Many of the women lost family and several houses were destroyed. They engaged in a two year rebuilding process (supported by many of you, thanks!) and in 2012 the community was back. 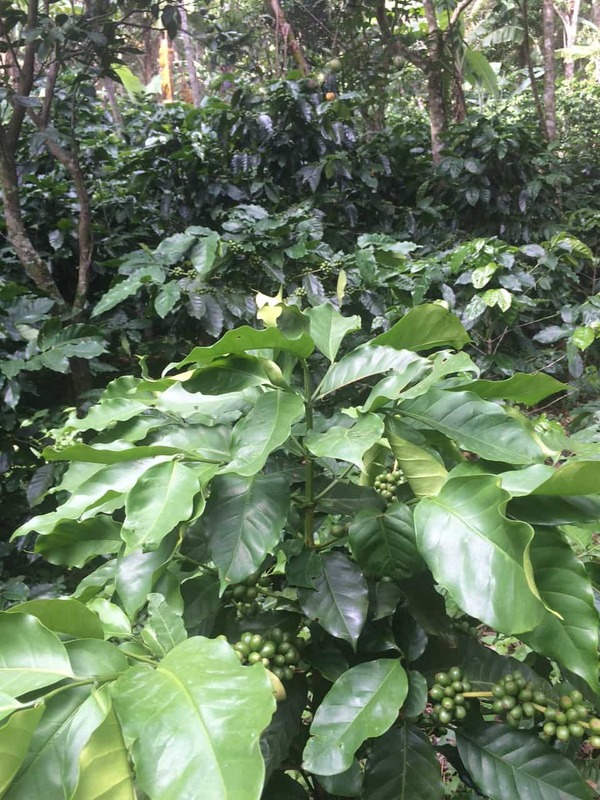 Howeber, within a year they began to see the effects of the Coffee Rust fungus (Roya), which over a two year period devastated their coffee crops and reduced their harvests by around 80%. This coupled with a drought that killed most of their food crops, sent them back into crisis mode once again. This is the backdrop that our group walked into in 2015. It had been almost two years since I had been in the communities and I was anxious to see what kind of progress they had made in recovering from the Rust. Even though with our non-profit partners On The Ground – with your help – raised close to $25,000 in the past 16 months to help support their recovery, we have only scratched the surface of the need for their larger project that not only addresses replanting rust-resistant coffee, but also the need of technical assistance, capacity-building, and diversification with a focus on food security in their communities. What our group found was probably a best case scenario in terms of effectiveness of the resources we have sent and the maximization of its value to the women, their families and their communities. One of the biggest changes that I found in the Diosas communities is the adoption of the idea of “Agroecology”. Agroecology is “The application of ecology to the design and management of sustainable agroecosystems. 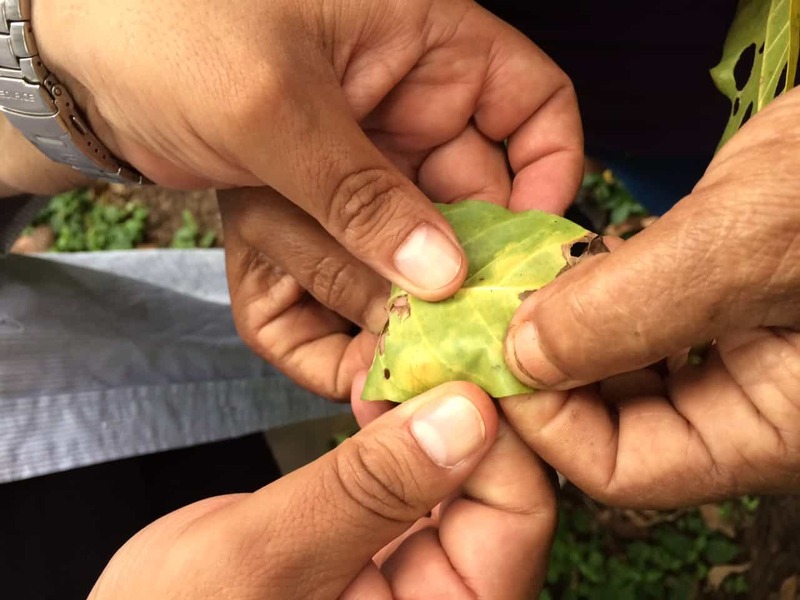 A whole-systems approach to agriculture and food systems development based on traditional knowledge, alternative agriculture, and local food system experiences” according to agroecology.org. The women explained it as a holistic way of thinking about farming and farmers’ lives & communities. It has led them to deepen their commitment to organic production, going beyond its basic requirements to look at soil systems and plants as living things that should be nourished and treated with deep respect. Out of this innovation in thought they have already achieved a lot. For starters, earlier this year Las Diosas sent four young people to receive training in soil analysis that allows them to test the soil of each woman’s plot in order to identify any mineral deficiencies that limit their production. After the soil is analyzed, they create organic fertilizer that consists of locally harvested minerals, coffee pulp, worm compost, micro-organisms, and other materials. Seeing plots where this treatment has been going on through a cycle and the health of the plants was mind-blowing. 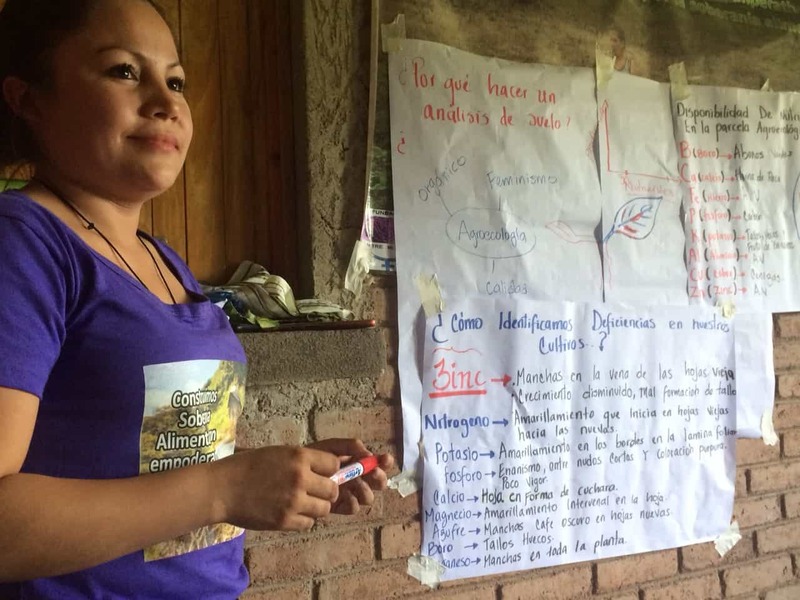 The four newly-trained tecnicos hold sessions in each farming community teaching the women to analyze soil. In doing this, they are saving thousands of dollars in lab costs by teaching farmers how to do this work themselves. A trained tecnico teaching the female farmers (and us) about soil analysis. The plants thriving in this new system are not just new Roya-resistant coffee plants that they have planted in their fields. They also have been able to save many of their heirloom plants including a lot of Caturra – a type of coffee that produces high cup quality and one that many of us thought was on its way out with the Rust. We visited the farm of Doña Veronica – a very experienced farmer in Los Llanos with a gorgeous farm. During my last visit it appeared that her Caturra was devastated and that she would be starting from scratch. Using the new agroecological fertilizer treatments her farm is so healthy and lush that CLAC (the Latin American fair trade farmers group) is sending farmers from all over Nica and other countries to learn from her. The difference in how the farm looked now compared to how it was in 2013 was almost unbelievable. Another innovation that FEM and Diosas have begun is to involve young men in their projects. They have started a young men’s group with around 40 men, from various communities, that focuses on teaching men that Machismo and violence against women is not natural, but in fact a learned attitude and behavior that can be unlearned. One of the four youth trained in the advanced fertilization techniques is a young man, who identifies strongly as a feminist, and who is the leader of the men’s group. This is also a part of their agroecological philosophy. All said, we saw two plants with obvious Roya – and even those we had to ask to see – as they were not apparent. The other Roya-ridden plants have largely been healed, eradicated, or cut way back in order to let them sprout new healthy branches. There is still a lot of work and replanting to do and not all the women have been able to access the plants that they need. Las Diosas estimates, that for the next two years their harvest will still be low, but by the third year they will be producing a higher quantity and quality of coffee than they have ever done in the past. Healthy coffee plants – Roya free! This brings us to the obvious question – what are these women doing to survive in the meantime as their income recovers? Find out more in next week’s post!